I haven't touched a book since Tuesday. No. And it's not just because I need to go to the library -- I'm too busy playing Katamari Forever to read. Katamari Forever is the fourth console game in the Katamari series and the sixth including a version for the PSP and iPhone (another reason to want an iPhone). In this game, you play as the tiny green prince, whose enormous father, the King of All Cosmos, has been knocked on the noggin by a passing meteor and fallen into a coma. You and your intrepid band of cousins build a robo-King to replace him, but it has ... issues ... and destroys all the stars in the sky! In the end, it's up to you to restore the cosmos. How do you do this? A perilous quest, maybe? Oh, no. That wouldn't be any fun at all! No, you rebuild the cosmos by rolling around a sticky ball. Yes. The more you attach to the sticky ball, the bigger it gets and the bigger the items you can stick to it. When you start, the ball's only a few centimeters across and you can only pick up things like thumbtacks or earrings. Eventually, you work your way up to things like shopping carts, whales, and buildings. When you have a big enough sticky ball, it becomes a star and you start all over again. Go on, tell me that doesn't look like highly addictive fun. Kerish-lo-Taan, third and most favored son of the Emperor of Galkis, is charged by the High Priest of Zeldin to go forth into the world and discover The Promised One who will deliver Galkis from the gathering darkness. To do so, Kerish will need to win seven keys from seven sorcerers and unlock "the last gates." He is accompanied by his half-brother, Forollkin, who does not quite believe the young Prince is up to the task, but is bound by ties of love and honor to support him. I remember reading the Seven Gates quartet when I was twelve-ish and being really taken with what struck me as a very moral and mythic ending. As an adult, I can more clearly see the flaws in Prince of the Godborn, but it is still a good read with lots of interesting philosophy and world building. Will I be going on to the next book, The Children of the Wind? Of course. It's already on hold at my library. 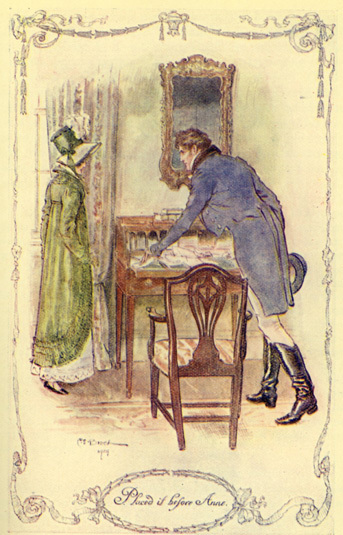 Swooning Over Austen: "You pierce my soul." I finished re-reading Jane Austen's Persuasion yesterday and, even though I've read the novel three times now, Captain Wentworth's letter to Anne still makes me feel a bit swoony! Who could resist such a letter? I made basil lemonade! Yes, I did! And it tastes good. 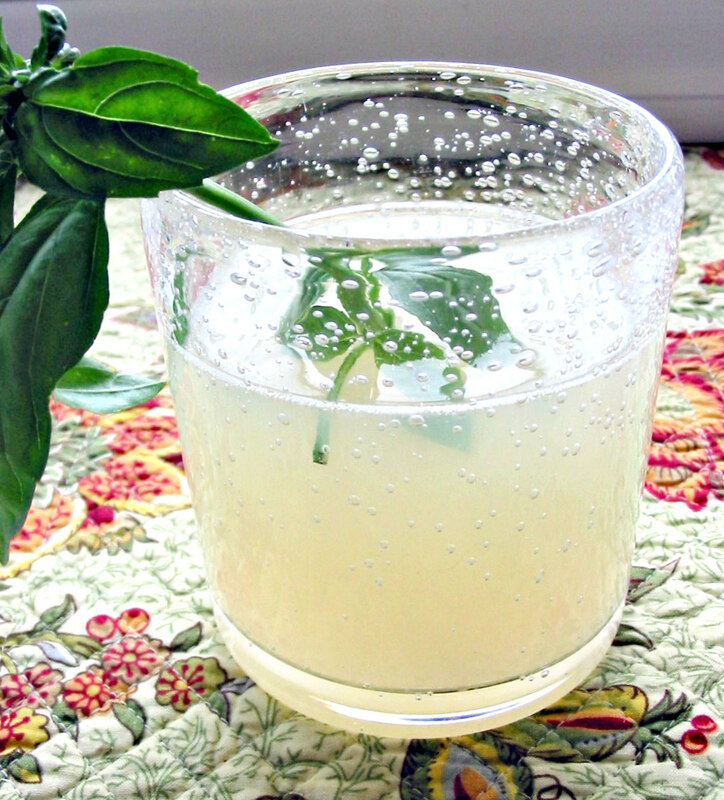 I used Real Simple's recipe for "Basil Lemonade" and it took no time at all. Just make a simple syrup, chuck some basil in, let the syrup cool to room temperature, and mix it with your beverage of choice. I mixed mine with lemonade, but the recipe also suggests ginger ale, iced tea, mineral water, or sparkling wine. I bet I could even make a tasty lemon drop with this syrup! Sunset's "Tomato and Basil Orzo Salad"
So I ran a little mad over the weekend and tweaked this blog a bit -- added a custom font, signature, and horizontal menu bar. I've already talked about adding a signature to my blog footer and Allblogtools.com offers a great tutorial on using Google Fonts in Blogger, if you're interested in that sort of thing. That just leaves explaining the horizontal menu bar. I wanted a horizontal menu beneath my header where each menu item linked to a particular group of blog posts (a YA button to all YA-labelled posts, etc). Since I couldn't do this with Pages, I did it the old-fashioned way -- I threw HTML at it until it looked okay. Want to try? Go to Design & select Page Elements. Select Add A Gadget located directly beneath the blog header. I know! I was making horizontal menus that looked like this in 1996! (I could probably have gone into my Blogger template and cobbled together some CSS, but this HTML-based hack was much easier and has the added benefit of being immediately deletable when I decide I hate it). We walled the room off the kitchen with bookshelves when we moved in, so our library is generally the first thing people see when they come through our door. It seems, I think, improbable to some visitors that anyone would own so many books and quite a lot of them say something like "wow, did you read all those books?!" or "you must really love books!" No, we have not read all those books (TBR Challenge, I need you) but, yes, we really do love books -- whatever that means. If consumption represents degree of desire then I definitely love books more than The Husband does. If dedication to genre represents degree of desire then he probably outstrips me as he tends to read only certain kinds of books while I ping-pong from one delicious read to the next. Excluding graphic novels and manga, I suspect we own well over a thousand books. Fantasy and science fiction make up a large chunk of our library with the rest being an eclectic mishmash of everything from LGBTQ fiction and childhood favorites to feminist theory and poker manuals. We could own far more books in far greater variety, but the local library system fulfills most of our bookish needs these days and much of our collection consists of books purchased five or more years ago. Still, it is a large number of books, and sometimes when people look at our bookshelves, I am embarrassed by the size and variety of our library. It seems downright decadent to own so many books and to own them in so many different genres ... well, that clearly smacks of intellectual fickleness. Proulx next to Pratchett. Tepper cuddled up with Thackeray. Oh, the madness! But I can't imagine ever being satisfied with only one kind of book. On any given day, I may want to pay Granny Weatherwax a quick visit while reading about how black holes work. Or I might want a little doomed Russian love affair while Pa digs a well in Indian country. Why should I limit myself? I see a lot of bookish bloggers end their posts with signatures and I thought I would give it a try. It turns out to be very easy. The most time-consuming part was deciding what I wanted my signature to look like! Go to My Live Signature and select Click Here to Start. Under Creating a new signature, select Using the signature creation wizard. Under Finished! The signature is ready, select Want to use this signature? Copy the code displayed under Generated HTML Code for your signature. There are two ways to insert your signature into your blog posts. The first, the easy way, is the method most tutorials use. The second, the slightly harder way, is the method I used. They yield slightly different results so I'll explain both methods. Scroll down to the bottom where there is a box titled Post Template. Paste the copied signature into the box. The next time you go to write a post, your signature code will already be in the text box. Make sure the code stays below your text as you type or your signature will not display at the bottom of your published post. Select Design and Edit HTML. Paste your copied signature code directly below that code. If it works, your signature will display at the bottom of every post you have published. What is your favorite smell and why? Does it bring back memories? I have lots of favorite smells, but they're kind of hard to articulate. I mean, I love The Husband's smell, but I couldn't describe it to you. It just ... smells like The Husband. Good. Warm. Safe. The same with my mother's house. Even though she does not live in the house I grew up in, her house still smells like "home" to me. What does "home" smell like, exactly? Memory? I've always loved the smell of the sea. It is one of those smells that immediately cancels out whatever else I might be feeling and brings me to a calmer, happier place. Throughout high school and college, I worked part-time at a pharmacy in a seaside town. I used to love driving in to work early in the morning while the fog still hung heavy on the bay. I would roll down my car windows and the heavy, wet, salty, fishy air would saturate my car. It was very calming and it was the best part of my day. 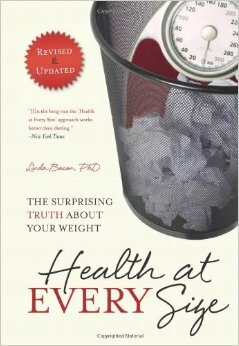 Despite its subtitle (which screamed "fad diet book" at me, but I may just be paranoid), Health at Every Size is not a diet or weight loss book. Instead, it is a commonsensical guidebook for living healthily in the bodies we have. Bacon proposes that anyone, at any size, can be healthy. Rather than focusing on what we think a scale or mirror is telling us, we should instead focus on eating well and living an active life. 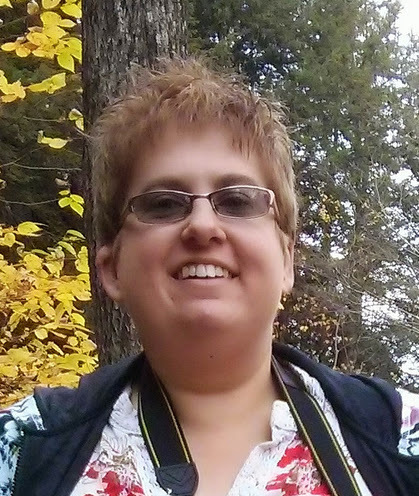 As long as our health is good (low cholesterol, blood pressure, and glucose readings, etc) why should size matter? Exhausted and infuriated as I am by society's constant, casual assumption that thin = healthy, I found Health at Every Size quite refreshing. I do remember rain -- that's what winter always meant, warm sheers of rain lashing the hills. Old-timers could talk about snow, it didn't sound all that great to me. My Lord, you'd have to put on two, three sweaters. I never did like heavy clothes. But rain, with the barn all fuzzy from the big drops beating off, the gutterspouts shooting water -- there was a rage about it that I liked. So I missed that, when it didn't come. Earthquakes. Volcanic eruptions. Oil spills. Mile after mile of dead forests. Green skies. Relentless heat. It looks like the Earth is dying and Jesse will die with it ... unless she cons her way aboard the space station her brother has been working on. 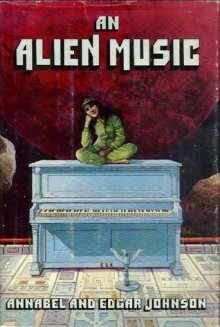 I must have read An Alien Music a dozen times in junior high and, re-reading it as an adult, I can see why I was so enamored with it. While the plot is full of holes you could pilot a Sky-Lab through and the May-December romance is a little creepy, An Alien Music still remains an amusing little scifi coming-of-age story with a strong, likable protagonist. End of the world or not, Jesse is going to seize her future with both hands. And, while Jesse may not always make the right choices and gets into a lot of scrapes, there can be no doubt she is motivated by a strong sense of Right. "This is no longer a part of Texas, no longer a part of the United States of America! You are in the buffer zone! You are no longer American citizens! By consenting to remain, you have agreed to this! 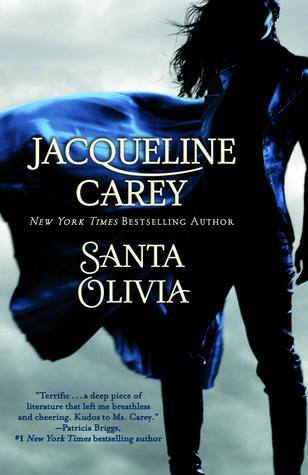 The town of Santa Olivia no longer exists! You are denizens of Outpost No. 12!" In the wake of a devastating pandemic, the US puts up another Wall between Mexico and the United States. Residents of Santa Olvidada who stayed between the Walls when the soldiers came lost their US citizenship and became nobodies dependent upon the sufferance of the local US military base. There is only one way out of town and no-one from Outpost has yet managed it. But Loup Garron might. Born on the Festival of Santa Olivia and raised in her church, Loup possesses unusual physical gifts -- gifts which may be the salvation of Santa Olivia. Santa Olivia is, I guess, best described as urban dystopian sci-fi coming-of-age story with a bit romance thrown in for color. Really, it's such an interesting mix of genres that I think it could be one of those books that inspires readers to stretch outside their comfort zones. While it's not a perfect read -- some of the back story could be fleshed out more and the ending was a bit of a cliff-hanger -- I presume many issues will be resolved in the sequel, Santitos at Large, which Carey's website indicates will be published in 2011. I was looking for something short and funny when I stumbled across Elizabeth Bergs short story collection The Day I Ate Whatever I Wanted. As I've been a great fan of Elizabeth Berg's novels since reading Range of Motion, I was pleased to have discovered it. This was an excellent book of short stories about the everyday worries of women -- age, weight, relationships, etc -- and many of the stories resonated with me in an extremely personal way. 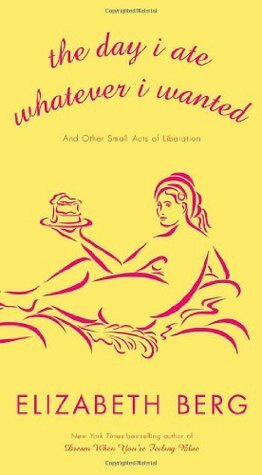 The title story, "The Day I Ate Whatever I Wanted," it's parallel story, "The Day I Ate Nothing I Even Remotely Wanted," and "Double Diet" are my three favorites from this collection -- as a fat woman who has sometimes dabbled in the land of Weight Watchers, I found them incredibly amusing and very true. But now I was feeling the shame but also defiance. Like here, I'm carrying the banner for all of you who cut off a little piece wanting a big one, who spend a good third of your waking hours feeling bad about your desires ... we who cannot eat air without gaining, we who eat the asparagus longing for the potatoes au gratin, for the fettuccine Alfredo, for the pecan pie. The remaining ten stories in the collection are also very good. Indeed, there was not a single story I didn't like!